“Columbia, he has landed Tranquility Base. Eagle is at Tranquility. I read you five by. Over.” The voice from Houston betrayed no emotion, although this was anything but business as usual. A human being was about to set foot on the moon for the first time in history, armed only with the Stars and Stripes, some scientific instruments, and an almost reckless, can-do demeanor that had captivated the world. The reply from Columbia, the command-and-service module that had released the lunar lander 2 hours and 33 minutes earlier, betrayed only equal professional cool. “Yes, I heard the whole thing,” Michael Collins said matter-of-factly. That’s when Neil Armstrong chimed in. “Yeah, I’ll second that,” said the 38-year-old astronaut, the moonwalker-to-be, America’s own Boy Scout, and the most famous man in the – well, in the universe. And even though the static ate away at the clarity of his consonants, Armstrong’s sneering tone came through loud and clear. The mission control man heard it too. And he knew what was coming. Sort of. There was a moment’s silence. Then a cameraman sniggered. And the director sighed, and did what directors do when actors screw up their lines. “Cut,” he groaned. He was a heavyset man in his 50s, and the combination of the long hours and the hot studio lights had started to get to him. His assistant stepped forward with the slate. “Apollo moon landing, scene 769/A22, take three,” she announced. “Columbia, he has landed Tranquility Base,” the mission control man began again. The history books lie. So do the encyclopedias and the commemorative videos and the 25-year-old coffee mugs with the proudly smiling faces of Neil Armstrong, Edwin Aldrin, and Michael Collins. When Armstrong got down from that ladder, proclaiming that it was only a small step for him but a giant leap for mankind, he was merely setting foot on a dust-covered sound stage in a top-secret TV studio in the Nevada desert. NASA’s cold warriors and spin doctors faked the whole moon landing. Come to think of it, they faked all six moon landings – spending around US$25 billion to prove to the world that not even the Soviets, especially not the Soviets, could hold a candle to the US when it came to space exploration. Well, at least, that’s the view of writer Bill Kaysing. It’s also the conviction of millions of Americans who have learned to distrust their government with a passion. Most of these skeptics don’t even appear to be steamed about the alleged superfraud. They shrug and raise their palms and go about their business. Not Kaysing. He seems to have never heard a conspiracy theory he didn’t like, and this one tops ’em all. For almost 20 years now, he has been trying to get out “the most electrifying news story of the entire 20th century and possibly of all time.” He has written a book aptly titled We Never Went to the Moon and won’t give up trying to uncover more evidence. There is an almost instinctive rejoinder to all of this: but we saw it. 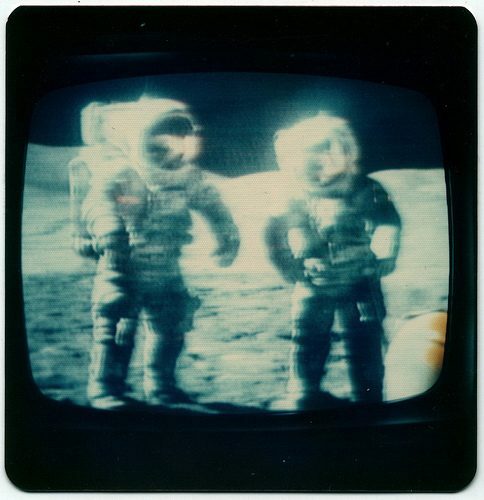 If television ever had a killer app, the moon landing was it. We bought new sets in droves, flicked them on as zero hour approached, and, miraculously, felt ourselves being locked into an intangible but very real oneness with a billion other people. It was our first taste of a virtual community, of cultures docking. It felt good. And now there’s this guy telling us that it was all a lie? C’mon! His rockets are a little loose. What proof does he have anyway? Kaysing points out numerous anomalies in NASA publications, as well as in the TV and still pictures that came from the moon. For example, there are no stars in many of the photographs taken on the lunar surface. With no atmosphere to diffuse their light, wouldn’t stars have to be clearly visible? And why is there no crater beneath the lunar lander, despite the jet of its 10,000-pound-thrust hypergolic engine? How do NASA’s experts explain pictures of astronauts on the moon in which the astronauts’ sides and backs are just as well lit as the fronts of their spacesuits – which is inconsistent with the deep, black shadows the harsh sunlight should be casting? And why is there a line between a sharp foreground and a blurry background in some of the pictures, almost as if special-effects makers had used a so-called “matte painting” to simulate the farther reaches of the moonscape? “It all points to an unprecedented swindle,” Kaysing concludes confidently. Easy, says Kaysing. The rockets took off all right, with the astronauts on board, but as soon as they were out of sight, the roaring spacecraft set course for the south polar sea, jettisoned its crew, and crashed. Later, the crew and the command module were put in a military plane and dropped in the Pacific for “recovery” by an aircraft carrier. (Kaysing claims that he talked with an airline pilot who, en route from San Francisco to Tokyo, saw the Apollo 15 command module sliding out of an unidentified cargo plane, but he can’t provide the captain’s name or the name of the airline.) The moon rocks were made in a NASA geology lab, right here on earth, he continues. Not very many people on the Apollo project knew about the hoax, as they were only informed on a need-to-know basis. Cash bonuses, promotions, or veiled threats could have ensured the silence of those who were in on the whole scheme. As this issue of Wired goes to press, a new book is headed to the stores: Was It Only a Paper Moon, by Ralph René, “a scientist and patented inventor.” Published by tiny Victoria House Press in New York, in what it has announced will be a first run of “at least 100,000 copies,” Paper Moon supposedly presents the latest scientific findings regarding the moon landing. René offers data suggesting, among other things, that without an impractical shield about two meters thick, the spacemen “would have been cooked by radiation” during the journey. Ergo, the lunar endeavors were impossible, and were cynically faked at the expense of gullible people everywhere. Nonetheless, hoax believers can be found in many parts of society, here and abroad. According to Oberg, Cuban children are officially taught that Yankee space technology failed miserably and that NASA was reduced to pitifully faking every single lunar landing. Some New Agers also contest the possibility of moon landings, as do Hare Krishnas. Non-mainstream Christians at the Flat Earth Society – a Lancaster, California-based anti-science group of about 3,500 members – contest the entire field of astronomy (not to mention moon landings). They liken the towering launch pads to the Tower of Babel. Peter Hyams, Capricorn One’s director, agrees that mass media can be very powerful – dangerously so, in fact. “My parents believed that if it was in The New York Times, it was true. I was part of the generation that grew up believing that if we saw it on television, it was true. And I learned how inaccurate newspapers were, and I realized that TV is just as inaccurate, or it can be. So I said, wouldn’t it be interesting if you took a major event where the only source that people have is a television screen, and you showed how easy it would be to manipulate everybody.” Hyams insists that he made Capricorn One “for entertainment, for fun,” not because he was making not-so-veiled references to the alleged Apollo hoax. “I was aware that there were people who believed that we never walked on the moon, but I never read their books or consulted with them. And frankly, I think they are being totally ludicrous.” (Nevertheless, an invitation to a sneak preview screening at the time of Capricorn One’s release said: “Would you be shocked to find out that the greatest moment of our recent history may not have happened at all?”) The concept of the moon swindle holds a certain appeal for other filmmakers as well. In Diamonds Are Forever (1971), James Bond accidentally stumbles onto a movie set that consists of rocks, a lunar backdrop, and a vehicle that looks like NASA’s Eagle. Men in spacesuits move about slowly and clumsily, as if simulating low gravity. Bond’s pursuers give chase, but 007 – stirred, but not shaken – climbs into the lunar lander and makes his escape. The scene is never explained. In the high-tech thriller Sneakers (1992), Dan Aykroyd’s character, a gadgeteer and conspiracy enthusiast, refers to the moon landing by casually remarking: “This LTX71 concealable mike is part of the same system NASA used when they faked the Apollo moon landings.” And a small San Francisco Bay area production company with a big name, Independent Film and Video Productions, is working on an as-yet-untitled feature film in which a writer discovers that the moon landings may have been simulated – and then nearly gets killed in his quest for the truth. Imagine a telescope lens with a diameter of 24 feet and a weight of almost 15,000 pounds. With it, you could see insects on the moon. OK, so there is no life on the moon – but that’s not what the readers of the New York Sun were told. In August 1835, the penny paper reported the “findings” of the British astronomer Sir John Herschel. In a six-part series, reporter Richard Adams Locke wrote that the scientist, using a huge custom-built telescope in a planetarium at the Cape of Good Hope (at the southern tip of Africa), had spotted many spectacular species on the moon. Among them: horned bears, tailless beavers, and 4-foot-tall ape-like creatures with thick beards and large wings. Locke referred to them as “bat-men.” Actually, there were plenty of bat-women too, and the two sexes engaged freely in behavior that Locke declined to describe – it would have been “improper” on earth. Herschel was a legitimate, respected scientist who remained unaware of his fictional discoveries for months. When word of Locke’s elaborate yarn reached him, he reportedly laughed and tried to expose the hoax – to little avail. On June 20, 1977, Anglia TV in England caused a nationwide stir when it broadcast a documentary called Alternative Three. By linking facts with half-truths, and by staging interviews with so-called “astronomers” and “astronauts,” the makers suggested that both NASA’s space program and the Cold War were decoys. The power elite in the USSR, the US, and Great Britain had in fact been working together on a secret project – Alternative Three – that had established bases on the moon and on Mars, so that they could escape the coming ecological nightmare on earth. Insiders who were deemed a security risk were callously murdered. Scientists had been abducted to do experiments in the space colonies. Even ordinary folks had been snatched and forced into slave labor on the moon and on the red planet. Surprise! It was all a hoax, made clear by the closing credits that listed the actors on the show and that contained a copyright notice dated April 1. Nonetheless, Anglia was flooded with calls, and newspaper headlines reported “shock” and “panic.” To this day, some people believe that all of it, or some of it, is true. Anagram enthusiasts will find that Rogier van Bakel (rogier@reporters.net) has Brave Ink Galore. He is a Dutch correspondent in Washington, DC. Reprinted with the Author’s permission. May not be distributed in whole or in part without the Author’s written consent.